Well this is it, my week in Cornwall is now over. Although I’m writing this on Friday evening I’m not bothering to publish it tonight, as I know there’s no point seeing as everyone will be watching the World Cup. My last day was an office day again. Still more work on the British National Party story was needed with a few more facts and information needed for my story. This picture possibly gives an indication on what the story revolves around. 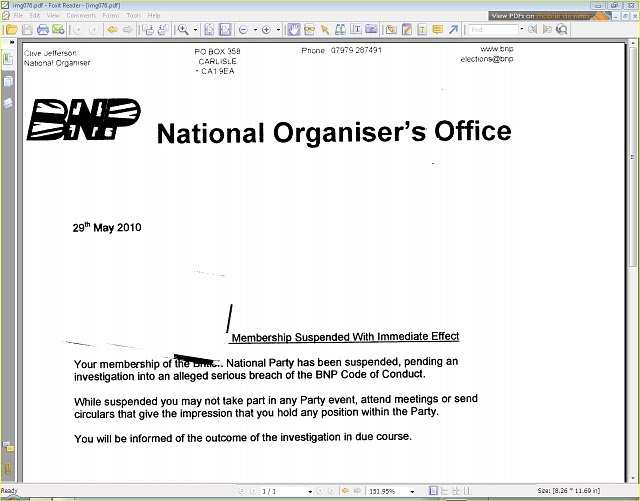 This isn’t the only one that has been sent out to Cornish members in recent weeks and there has been some unrest regarding the party’s treatment of some members. I was also required to fulfil a fairly mundane job of ringing round the local primary schools to see if any of them had any events coming up soon which could be covered by the Cornish Guardian, even if it’s just sending a photographer down. Well someone came into the office with this poster and asked if we were happy to have it up on the door. We agreed. 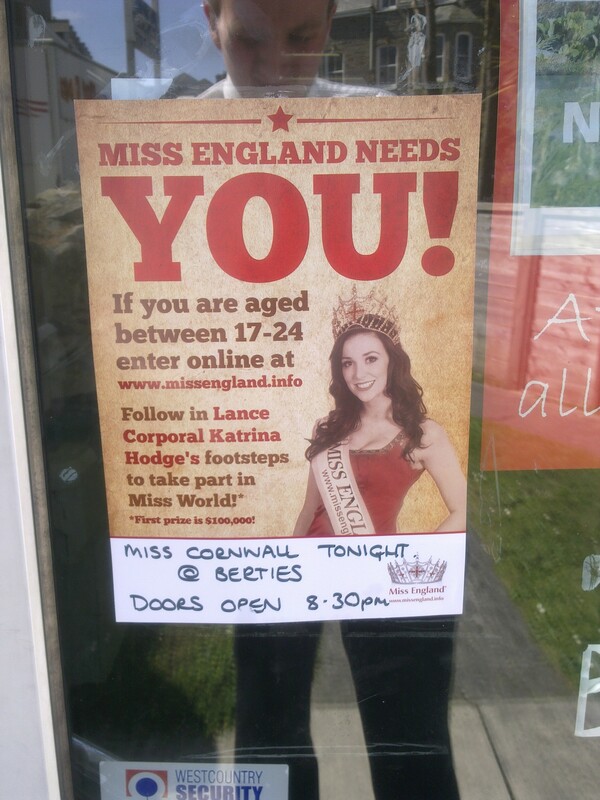 Miss Cornwall was held last night next door to our office, however none of us went. I know some of you may not agree with beauty pagents however it was a moment of a relatively quiet day when the mother of the current Miss Cornwall (Charlotte Holmes) came in to ask for permission to put the poster up. 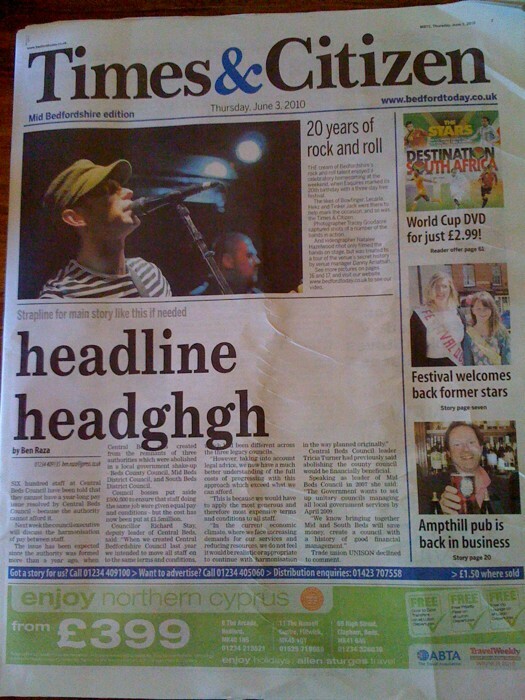 I also apologise that my mug appears in this photo, not much I could do about it! I had a quick trip out to next door’s pub in the afternoon to keep tabs on the first match of the World Cup, though annoyingly I missed the goals. Sticking to the World Cup theme I found this article earlier from the Western Evening Mail. I hear Emile Heskey Bus crashed into Rio Ferdinand bus the other day whilst Emile tried to go round a roundabout. Overall I’ve enjoyed the week. Being in a district office may not be as busy as working in a big city office but it’s still enjoyable and there is still plenty of news that needs to be reported. It’s a bit more relaxing too, not having others check up on you constantly and working in a quieter atmosphere but this does not mean that you slack. Deadlines are still to be met and the motivation is still high. Speaking to one of the reporters over lunch one day he admitted the pay isn’t great but he doesn’t do it for the money. He does it because he enjoys it. I know that one day, if I get a job and a career in the journalism industry, that I will work in an open plan office at some point and probably will spend a lot of my career in one. But I would like the chance of working in a small office at some point. Whether these offices and local papers survive long enough though remains to be seen. I’m not going into the economics of regional journalism now but it’s a well known fact that many local newspapers are losing money at a higher rate than ever before. What the situation is at the Cornish Guardian I wouldn’t know. What I do know is that I am allowed to return one day for more experience if I so wish, which can’t be bad.